Underpricing of Fed Rate Hike Expectations? Ask me what I am currently most enthusiastic about in the markets, and I’ll tell you it is the underpricing of rate hike expectations. Let me elaborate on why, what it means for investors’ portfolios and how to possibly profit from it. Lots of people ponder where interest rates might go. They may care if they have a loan where interest payments go up as rates increase; they might own bonds that might fall in value as rates rise; they might have an opinion on how the value of stocks, the dollar, gold, to name a few might be affected. And not surprisingly, investors can put money down, taking a position on where rates will be. Fed Funds futures are the most direct instrument reflecting investors’ assessment of where rates will be. For many years, the Fed raised rates less than the market had priced in at the beginning of the respective year; indeed, based on our analysis, 2017 was the first year since 2006 in which the Fed raised rates more than had been priced in at the beginning of the year. As can be seen on the chart above, rate hike expectations have steadily climbed, but recently had a setback that’s partially recovered. That setback was at least in part triggered by the rejection by Italy’s President of 81-year-old Paolo Savona as the country’s economy minister. In the recently sworn in government, Mr. Savona, who is known as a fierce critic of the euro, has been appointed European affairs minister. If nothing else, the episode illustrates how notoriously volatile expectations on future interest rates can be. The way I look at it, if my own view differs from that of the market, there may be a trading or investment opportunity. Italy undermines the integrity of the eurozone -> there’s a run on Italy’s banking system; -> contagion spreads to banks around the world (due to exposure of other banks to Italian debt); -> global economic growth slows down as banks hunker down; -> interest rates will be lower than currently priced in. As some have pointed out, if said scenario were to play out, odds are that the implications would have actually been far more severe than the comparatively little hiccup in the markets. More relevant possibly is that while global markets reacted, the reaction was far more muffled than the reaction in Italy. In my assessment, the key driver for the Italian reaction wasn’t that Italy was about to break apart, but because of the same issue we’ve had many times throughout the financial crisis: risk averse investors invested in risky assets under the misconstrued believe that their investments were safe. That is, investors chased Italian bonds, shrugging off the risks that come with the higher yields versus German bonds; after all, with European Central bank chief Draghi promising to ‘do whatever it takes’, what could possibly go wrong? Think of pressure building up in a pressure cooker; when investors realize these assets are risky after all, they run for the hills; in the meantime, when they sell, for every seller, there must be a buyer. The new buyer stepping in is a risk friendly buyer, one choosing to buy Italian bonds aware of the risks (and demanding a lower price / higher yield). This is a much healthier setup. Now consider that Italy has had about one government a year; there are European parliamentary elections next year; the two coalition partners are going to be running against each other in those elections. The new Italian government has also indicated it wants to keep the euro; Italians overwhelmingly want to stay in the euro. Greece has shown that even radical parties bow to pressures of the eurozone as leaving the euro is amazingly expensive even if they wanted to (mostly because, amongst others, money would be sucked out of the banking system as it would flee to banks in the eurozone protected from an Italexit). The new Italian government has a grand wish list of reforms that includes everything from a flat tax, a cutting of Italian bureaucracy, basic income for all and increased social benefits. Italy’s constitution requires a fiscally sustainable budget over a budgetary cycle, with Italy’s president able to veto it; with his controversial move to veto the appointment of the economy minister, Italy’s President has shown that he may very well be willing to block excessive spending attempts; that said, I sympathize with anyone who reconsiders their Italian investments in light of the proposed agenda. Nobody really knows how the Italian drama will play out, with odds high that even if things aren’t turning out all that great for the Italian economy, the ripple effects to the U.S. economy may be limited unless some really bad case scenarios unfold (also keep in mind that the institutional framework in the eurozone has been substantially strengthened, allowing a more effective crisis management should one occur). Nobody really knows how trade tensions with Mexico, Canada, the EU, China, to name a few will play out. President Trump himself has suggested he’s “playing games.” I encourage everyone to re-read his 1980s book ‘The Art of the Deal’ from which I conclude that he likes to corner others so that he can act from a position of strength; in this case, he appears to first create a minor crisis, so he can then emerge victoriously. 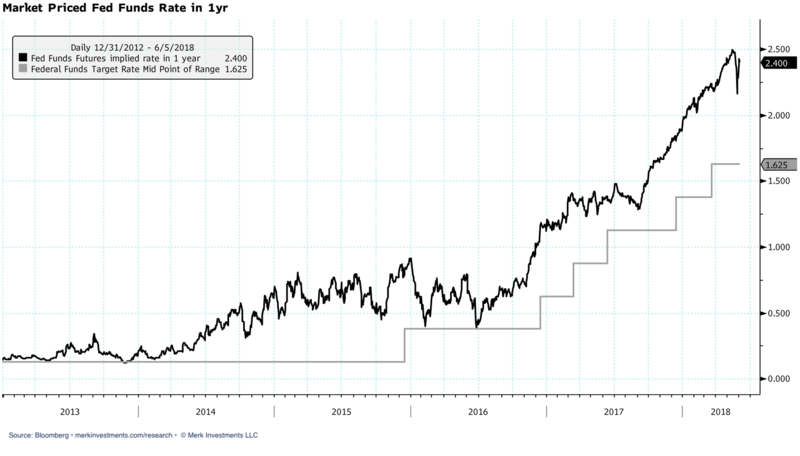 While he may be playing with fire, the reason the market has so far taken the trade tensions in stride may well be because the odds of Mr. Trump ‘striking a deal’ are more likely than a global trade war that might substantially hurt the U.S. I might just add that striking a deal with Canada and Mexico may be easier than with the European Union; that’s because the U.S. has had discussions for months with the NAFTA partners; in contrast, the very notion of deal making is rather foreign to the super bureaucratic pencil pushers in the European Union. China, with its autocratic government, is capable of striking a deal; the risk I see there more relates to inflexibility pertaining to geopolitical interests, such as defending interests in the South China Sea. If I interpret the Fed correctly, this all means that they will march on as planned and consider any of the above only if and when they actually affect the U.S. economy. Contrary to what some may think the Fed is not in the guessing game of how geopolitics affect the U.S. economy, even if some Fed Presidents come across as caring about what’s happening in the rest of the world. What about the tax reform? Here, too, the Fed may be slow to react, although the number crunchers at the Fed are starting to have a better idea of the implications. The chart shows the labor participation rate of 25 to 54 year-old men, so called prime-age males. 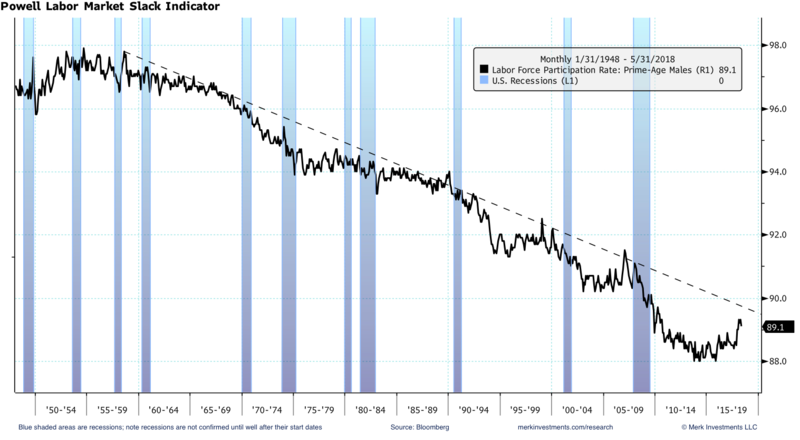 While the most recent data point was a dip down in the labor participation rate, men have been lured back into the job market in recent years. We think that the Fed will feel that they have to raise rates more aggressively once the dotted line is crossed, something that may happen later this year or early next year. By then, if we are correct, wage pressures will have also become more apparent. The FOMC statement, by the way, continues to read: “The stance of monetary policy remains accommodative.” Some Fed officials have indicated that this is needs to change. I agree; and when it does, the market may well come to the realization that the gradual tightening might need to accelerate a bit. The chart in the introduction suggests three rate hikes of 0.25% each in the next twelve months. Not shown is that by the end of 2019, less than one further rate hike is priced in. My own assessment is that four rate hikes in 2018 are very much in the realm of possibilities, with rate hikes continuing in early 2019 as inflationary pressures become more apparent. This also means that my current baseline scenario is that this economy will be brought to its knees the way a typical economic cycle comes to an end: a booming economy slows down due to Fed tightening. Indeed, it is called “tightening” because the very point of raising rates is to tighten financial conditions. The “watching paint dry on the wall” talk from former Fed Chair Yellen merely reflected that the Fed was petrified the market could over-react to the initiation of quantitative tightening. On that note, the reduction of the Fed balance sheet is expected to gradually accelerate based on the rules of the program. Many recall that the Fed turned from a hawkish tone to a dovish tone when the markets had a tantrum in early 2016. The key difference between early 2016 and recent bouts of volatility are exactly those “financial conditions.” In early 2016, as you may recall, the fracking industry had trouble accessing financing. Access to credit is what the Fed monitors very closely, fearful that trouble in one segment of the economy spreads to others. In contrast, the opposite is happening now: as is not uncommon in advanced stages of an economic expansion, banks are very eager to lend, and are easing lending starts. Increased volatility in various sectors of the markets hasn’t changed that. In my view, this means the Fed will not pause in its march to hike rates even if, say, equities, were to have a substantial downturn. Quite the opposite: because inflationary pressures continue to move higher and financial conditions remain loose, they have an incentive to raise rates. All else equal, higher rates increases the discounting of future cash flows. That means higher volatility in the current price (the present value of future cash flows) as the focus shifts to the shorter-term outlook as the longer-term outlook gets increasingly discounted. Risk assets is a general term for assets with a cash flow that’s either uncertain or far out in the future; equities and high yielding bonds are in this bucket, but any longer-dated bond may also be included. The greater discounting of future cash flows also suggests lower valuations – all else equal. All else, of course, isn’t equal. So if earnings continue to soar, higher valuations are possible. However, the risk to valuations increases. Our equity market chart book (also available at merkinvestments.com/research) points out bear markets tend to happen during recessions. That said, there are exceptions to this rule, notably the 1987 crash. - Gold as a diversifier? Is gold a good investment when rates rise more than expected? It depends. It depends on whether real interest rates, i.e. rates net of inflation, move higher. And it depends on how volatile things get. With regard to rates, I am arguing that the Fed is playing catch-up, not fully appreciating the inflationary pressures that have been building. With regard to volatility, gold doesn’t have cash flow which may be a key reason why the price of gold has historically done well when risk assets have done poorly. Indeed, in our analysis, the price of gold has risen in each equity bear market since 1970, with the notable exception when then Fed Chair Volker raised real interest rates rather dramatically in the early 1980s. - What about the dollar? Will the dollar surge as rates move higher? That’s too broad a topic for today, but let me just point out that the dollar rose for four years while rates didn’t move higher, then declined as rates actually started to move higher. While we touched on Italy, we haven’t discussed inflationary pressures in the eurozone; indeed, inflation expectations in the eurozone have continued to march higher. I wouldn’t be surprised to see the ECB move away from its stated plan to first end bond purchases (QE), then hike rates. To be able to manage a potential crisis in Italy or elsewhere in the Eurozone, the ECB might want to keep a tool around that allows it to ‘do whatever it takes,’ yet raise rates as the negative rates are, at least in my view, unsustainable. In the short-term, euro bulls are on the sidelines, but that may well change. I shall discuss other currencies some other day. Given the analysis presented here, you might see that I’m not terribly excited to deploy capital in equities. I also believe investors haven’t sufficiently diversified; after nine years of a bull market, I believe many investors are over-exposed to risk assets. I include in that bonds; the episode in Italy has shown that investors are buying seemingly safe fixed income assets, only to run for the hills when they realize such assets aren’t safe after all. Just because you think rate may be going up, doesn’t mean you will make money buying a contract on rising rates. That’s because the market may already be pricing in higher rates. The time there’s an opportunity to make money is if one believes rates will rise more than is priced in. Obviously the same applies if one were to take the opposite view, i.e. a position on rates being lower than is priced in. You are dealing with futures. If you have never traded derivatives, odds are you should stay away from them. There is a reason even many investment professionals are not licensed to trade them. They are a powerful tool if you understand how they work and the risks that come with them. To take a position of interest rates, Fed Fund futures may not necessarily be the best option. There are a variety of other instruments available in the market, catering to slightly different objectives and risk profiles. Note also while liquidity in Fed Funds futures is reasonably good for shorter-term positions on interest rates, there’s very little activity if you want to take a position on interest rates more than two years out. However, there’s a cousin to Fed Funds futures that banks use to manage interest rate risk in their loan portfolio; these contracts are, in our analysis, extremely liquid. The advantage of these contracts is that one can take a position on interest rates several years out (just like with bonds, though, the longer the duration, the greater the interest rate risk, meaning that the value of these contracts is going to fluctuate more as rate hike expectations change). If we haven’t scared you off, we may be of assistance (click here to learn more) in how to structure trades on interest rates, as a hedge to a portfolio or a speculative position. (*) As with any investment, it is important to have a plan, understand the risks, as well as to put any investment into the context of one’s portfolio. I’ve made the case here that rates in the U.S. may go up faster than currently priced in. I eluded that this may also be the case in the eurozone. That said, an investor may say the risk-reward ratio to take a position on higher rates this late in an economic cycle is not worth it, and instead design a plan now to take a position on falling rates. Historically, the Fed has lowered rates about 500 basis points, i.e. 5% in economic downturns. This may not be possible as rates may not go up to 5% before the Fed has to lower them again, but if one times the peak of the economic cycle correctly, there is more investors can do than position for a potential bear market in stocks. Keep in mind that most investors are not good at timing the top or bottom of most things in the markets. It comes down to executing a plan in the context of prudent risk management. With all this said, two topics come to mind that I couldn’t expand on as much as I would have liked to today: implications of the current environment for other currencies; as well as what the Fed will do in the next economic downturn. From what I hear Fed officials discuss, they are actively exploring what would have historically been considered most controversial and unconventional. More on those topics another day. To expand on the discussion, please register to join our Webinar on Tuesday, June 26 at 4:15pm ET. Explore our chartbooks, register for our free newsletter and follow me on LinkedIn, Twitter, Facebook or Patreon. P.s. : As of this writing, I hold positions in gold, on higher US and Eurozone interest rates. Such positions may change without notice and shall not be considered investment advice. (*) If you are an investment advisor interested in offering your client the opportunity to take a position on interest rates, please contact us so we can gauge how we might be able to be service.